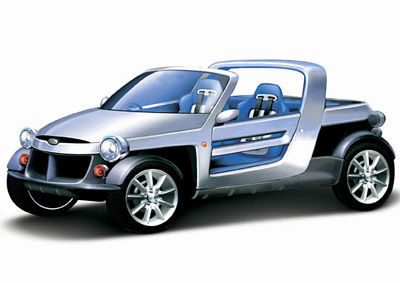 The Daihatsu D-Bone was a minimalist sports vehicle concept similar in theory to something like a mild off-road Ariel Atom, except with less power and more creature comforts. 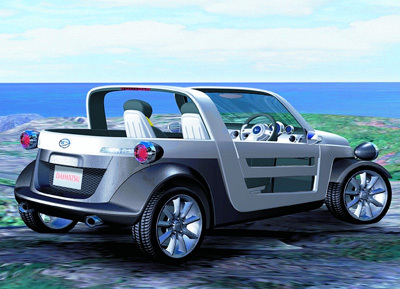 The D-Bone was first introduced at the 2004 Geneva Motor Show. The 'D' in the name stood for 'Dynamic' while 'Bone' was meant to underline the fact the concept lacked much of the bodywork or skin found on more conventional cars. 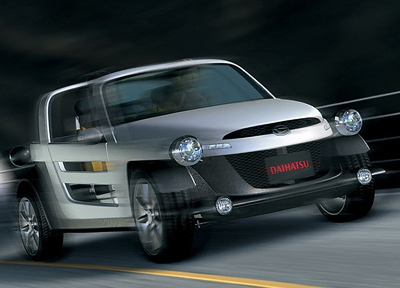 Mounted in the front of the Daihatsu D-Bone was a turbocharged, 659 cc, three-cylinder engine which produced 63 horsepower. This was connected to a 4WD transmission and thanks to moderate ground clearance the D-Bone was capable of mild off-road travel. The interior of the Daihatsu D-Bone had absolutely no weather protection at all, except for the windscreen. Because of this all the interior trim and materials are 100 percent waterproof.